Gillian joined the BTRC in June 2015, having come from a professional background in operational management specializing in B2B, CRM, Marketing and strategy development in the commercial and not-for-profit sectors in Ireland, United States and Hong Kong. Previous to joining BTRC she held the position of Equestrian Operations Manager for the Hong Kong Jockey Club. Gillian managed the HKJC Beas River facilities as well as being responsible for the rehabilitation and retraining of the retired racehorse population that were not exported by their race owners and overseeing the rehabilitation stables for active racehorses at BREC. As ninety-five percent of all the horses in riding schools and private livery stables in Hong Kong are retrained retired racehorses this provided Gillian with a huge amount of experience in this unique area which spans across the racing and equestrian industries. Privately, horses have always been a huge part of Gillian’s life and she has been involved in equestrian sport for 30 years, riding competitively in both show jumping and eventing and being a registered Instructor (BHSII, SM). Lauren joined the BTRC in March 2015 as the Office Manager after gaining a 2:1 in Business Management. She studied for her degree part time whilst previously working full time as the Office Manager for a Lancashire based youth charity. Lauren has experience working with horses as well as office based work, therefore enjoys the challenge of working at BTRC and the large variety of tasks her job covers. 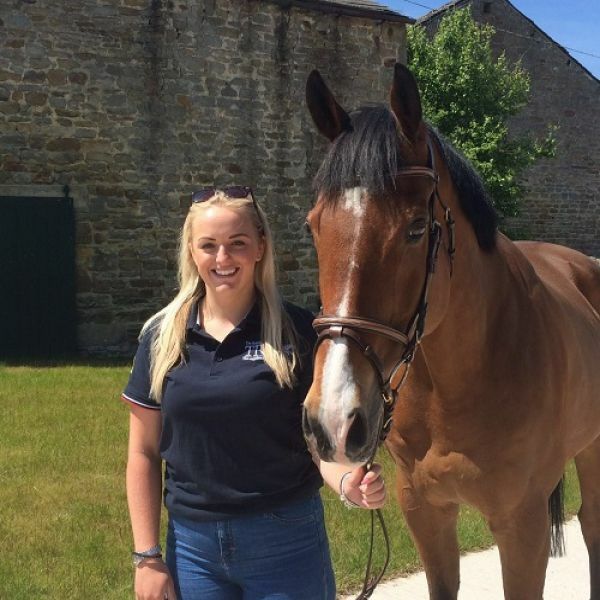 Lauren has been involved with horses all her life, riding competitively in British Showjumping throughout her junior years and now focusing on eventing with her own horse, Mr Ed. Ines oversees the progress of all horses going through the different stages of their retraining until they are ready to be rehomed as equestrian horses. Growing up around horses, she competed in dressage and show jumping throughout her junior years before graduating with a M.Sc. in Agriculture. Ines holds the German Trainer C “Leistungssport Reiten” and worked as the Head of Retraining for the Hong Kong Jockey Club focusing on the training and leading the daily operation. After returning to Germany Ines worked for the family-owned stud. Having previously worked at BTRC, Steph returned in Autumn 2016 after spending a season with event rider Izzy Taylor. Steph holds her BHS Stage 3 and is currently working towards her PTT. Not only a valuable member of the team, Steph is also a dedicated loaner of a BTRC horse, Finn Mac. She took him home after falling in love with him during her previous employment here and hopes to event him next season. Lucy learnt to ride at a very young age on Shetlands ponies after inheriting the hobby from her Mum. She has since worked as a riding school instructor in Cyprus and has more recently worked for an international eventer in Germany. She currently holds her BHS PTT and is working her way towards becoming a BHS AI. She has previously owned two ex-racers of her own and enjoys getting to know all the horses’ characters at TRC. 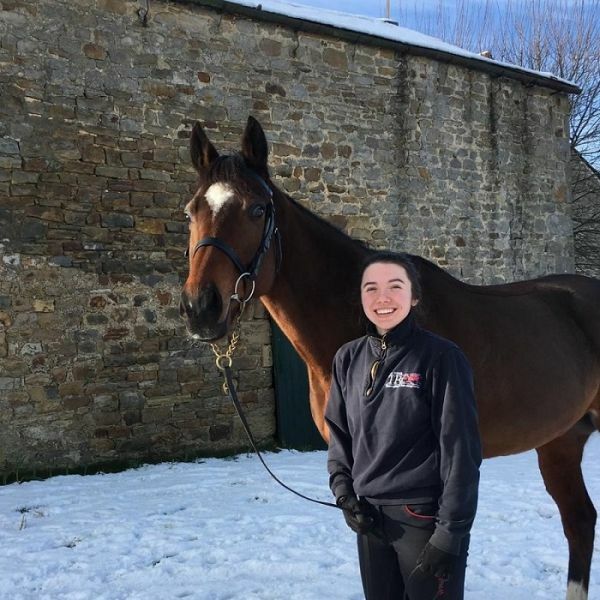 Rachel joined the BTRC in January 2018, after working at another horse yard in Lancaster. She owns her own horse Merlin and enjoys showjumping and hunting. Rachel has always had an interest in the racing industry and loves being part of the BTRC team, watching the horses progress through their retraining program and on to their new homes. In the future Rachel hopes to be able to retrain her own retired racehorse. 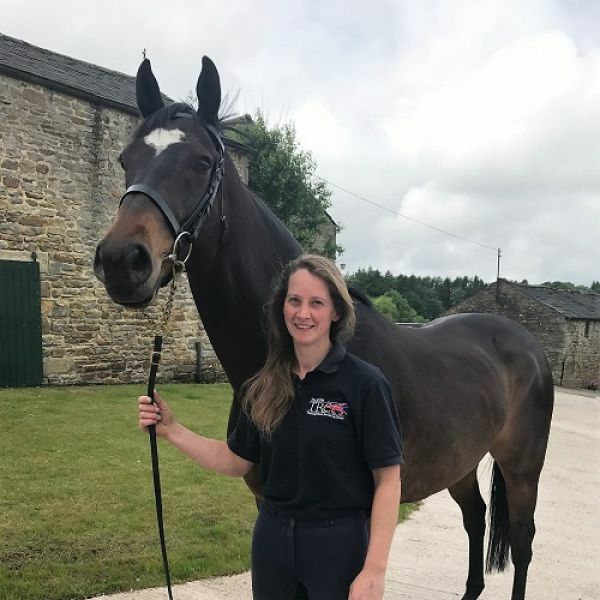 Caitlin started at the BTRC in February 2018 after previously attending the Northern Racing College in Doncaster. Caitlin is a big animal lover and has worked with horses since the age of 7 and owned her own Sec C called Sunny. As an apprentice, Caitlin is undertaking a Level 2 course in Horse Care – learning as she works at the Centre. Caitlin enjoys the monthly Vet Clinics and working with the team to help the horses through their retraining programs. 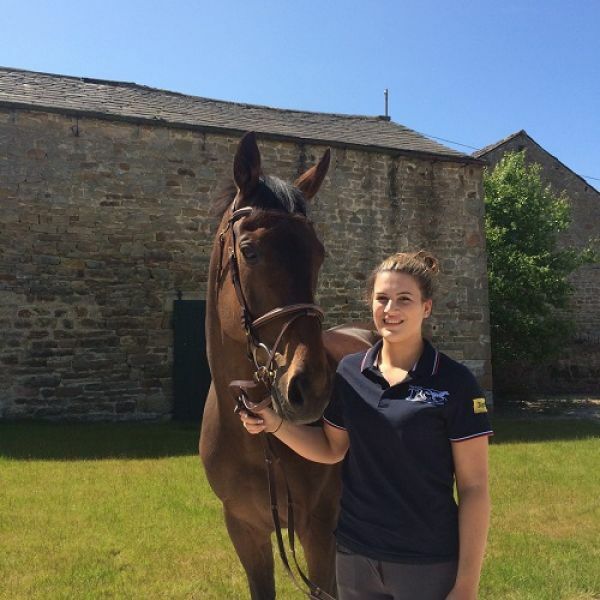 Having previously worked at a riding school, Hannah joined the BTRC in May 2018. She owns three of her own horses; Darcy (Thoroughbred), Quest (Fell Pony) and Lily (Welsh Pony). 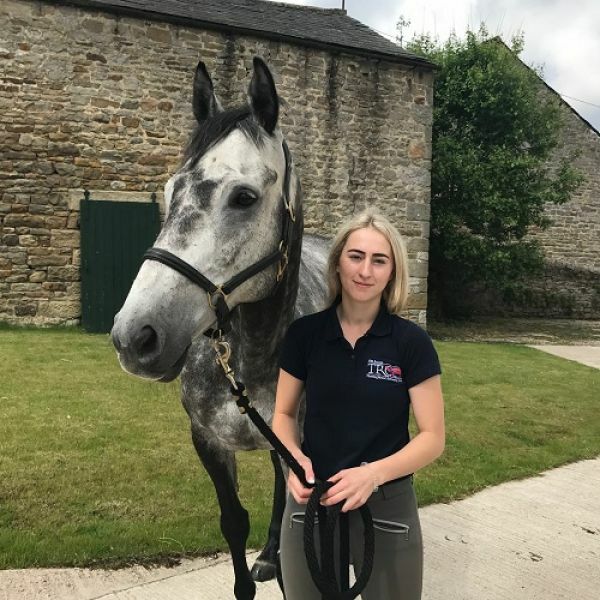 Hannah enjoys jumping and is currently retraining her own ex-racer to jump – working at the BTRC allows Hannah to build her skills working with Thoroughbreds so she can go home and work on her own horse. Hannah hopes to complete her BHS Stages to become a riding instructor in the future. Lauren joined BTRC in April 2018 bringing lots of riding experience with her! She has her Pony Club B Test and has competed up to BE Intermediate with her own horse. Prior to working for BTRC Lauren worked with competition horses in the Isle of Man before moving to the UK in 2017. In 2016 Lauren was a member of the Pony Club Rider Development Pathway Squad and is currently bringing on her home-bred 7 year old to event. Holly joined BTRC in June 2015, after previously working at a number of showing yards in Lancashire. She has completed her BHS Stage 1 and NVQ Level 3 in Horse Care and Management. Holly enjoys helping the horses through their retraining and likes to see them happy and settled in their new homes. Toni joined BTRC in May 2018 and brings a wealth of equine knowledge and experience. Toni holds her BHS Stage 3 and has competed in showing and British Showjumping at County Level for a number of years. Her love for horses is lifelong… she still owns her first pony who was 5 when he arrived and is now the ripe old age of 35! Toni enjoys working all the different horses at BTRC and seeing them progress from start to finish when they are ready for their loan homes. Charlotte joined BTRC in September 2016 and soon fell in love with every horse at BTRC! Her passion, knowledge and experience is admirable. Charlotte holds a BHS Stage 2 and the Ride & Road Safety certificate along with a National Certificate in the Management of Horses. Charlotte enjoys welcoming and settling in the new horses, as well as working with those horses in our rehab barn to ensure they are ready for retraining. She works closely with our Consultant Vet to ensure all horses are receiving the correct care/support they require. With 6 horses of her own and a BTRC horse on loan, Charlotte really does live, sleep and breath horses! !